Union County, NJ – On Tuesday, February 20, the Union County Board of Chosen Freeholders, through the Office of LGBTQ Services, hosted a roundtable with over 20 leading LGBTQ advocacy and ally organizations that serve Union County and New Jersey. Facilitated by Christian Fuscarino, Executive Director of Garden State Equality, more than 40 participants met to discuss LGBTQ-related programs, services, issues and priorities for 2018. 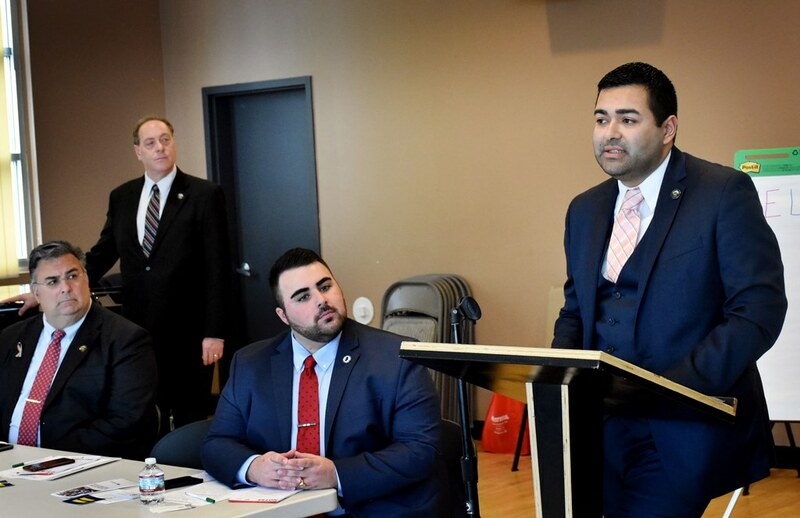 The roundtable was organized by the new Union County Office of LGBTQ Services that was established by Freeholder Chairman Sergio Granados as one of many progressive “Moving Union County Forward” special initiatives that he announced in January of this year. Garden State Equality Executive Director Christian Fuscarino encouraged open and engaging conversations about many unique challenges of the LGBTQ community including: access to healthcare services; state policy recommendations; safe spaces to live, learn, work, play and pray; access to resources and information; and achieving safety, permanency and well-being for LGBTQ youth and families. Participants also offered strategic thinking toward building culturally-appropriate programs and partnerships that affirm the dignity and human worth of LGBTQ people and supporters. This first organized meeting, as part of a series of outreach efforts, is to engage the LGBTQ and ally communities in a county-wide needs assessment. A priority of the Office of LGBTQ Services is to provide a platform for leadership and collaboration to support equality, and serve as a catalyst for advocacy, awareness and action on current and emerging issues that impact the lives of lesbian, gay, bisexual, transgender, and queer individuals. “On behalf of the Freeholder Board, I applaud the organizations who participated in the roundtable for the work they are already doing to support LGBTQ people, families and friends in our communities, and for participating in the roundtable with the shared goal of discussing existing programs, and addressing barriers, strategies and gaps in services,” said Freeholder Alexander Mirabella, liaison to the LGBTQ Ad Hoc Committee. Several prominent New Jersey organizations that serve the LGBTQ community commend the networking and results-oriented effort of the roundtable. “Leading by example to create a more inclusive community starts with the conversation. Union County’s LGBTQ roundtable is taking that lead and Hyacinth in proud to add our voice,” noted Hyacinth AIDS Foundation roundtable participants Danielle King and Allen Lockhart. “WellCare of New Jersey is dedicated to building partnerships with organizations working to make a difference in our communities. The Union County LGBTQ roundtable is one such example. It was an honor to be included in this important discussion with individuals who are truly passionate about eliminating the barriers facing LGBTQ families and WellCare looks forward to joining them in this commitment,” said Clarissa Robles, Sr. Community Relations Specialist for WellCare of New Jersey. “As facilitators of the first 2018 LGBTQ Roundtable, Garden State Equality was both honored and enthusiastic to share ideas with other incredible advocacy organizations and individuals. Events like this Roundtable are so important for addressing LGBTQ-related programs, services, and issues. We are so proud of the Union County Freeholders for establishing the Office of LGBTQ Services, the first county office in the state of NJ,” said Christian Fuscarino, Executive Director of Garden State Equality. Through assessment, research, analysis and strategic collaboration, the Office of LGBTQ Services, under the Division of Outreach and Advocacy in the Department of Human Services, provides essential support that impacts the quality of life for LGBTQ people and allies through community building and human services. “HMI: NJ is excited to partner with Union County to provide any complimentary services, training and or technical assistance to support the Union County Office of LGBTQ Services. Union County has taken great strides in advancing services to its LGBTQ residents. We are committed to supporting this initiative to ensure its success,” said Ashawnda Fleming, Ph.D., MS Executive Director, Hetrick-Martin Institute New Jersey. For more information about the Union County Office of LGBTQ Services, contact Danni Newbury, Coordinator, at 908-527-4742 or dnewbury@ucnj.org. Photo Caption (welcoming remarks): Union County Freeholder Chairman Sergio Granados, joined by Freeholders Alexander Mirabella and Bruce Bergen, welcomed roundtable facilitator Christian Fuscarino, Executive Director of Garden State Equality and over 40 participants representing more than 20 LGBTQ advocacy and ally organizations that serve Union County and New Jersey to the 2018 LGBTQ Roundtable to discuss LGBTQ-related programs, services, issues and priorities for 2018.